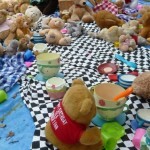 Come and join us for a teddy bears picnic at Foundry Wood on Friday 3rd June. Take part in a nature trail & scavenger hunt, craft activities and build your bear a den in the woodland. Bring your teddy bear and own picnic. Squash provided. £3 per child, booking essential. Please use the form below to book your tickets for our 12.30 session and confirm your place.